How do I use my smart phone camera as a webcam in MATLAB? I have an smartphone device with a camera. I would like to obtain and process this image data in MATLAB. (Specifically, I have an Android device). is there any other solution that make matlab still running in the foreground, I tried this method yet it require the ip cam to run in the foreground i need matlab to be still running for later image processing. Also is it possible to access the smart phone camera using matlab mobile Specifically to iphone camera ? The general solution would need two parts, one to broadcast the data from the device and another part to read this data into MATLAB. In the camera preview window, note the url at the bottom of the screen. 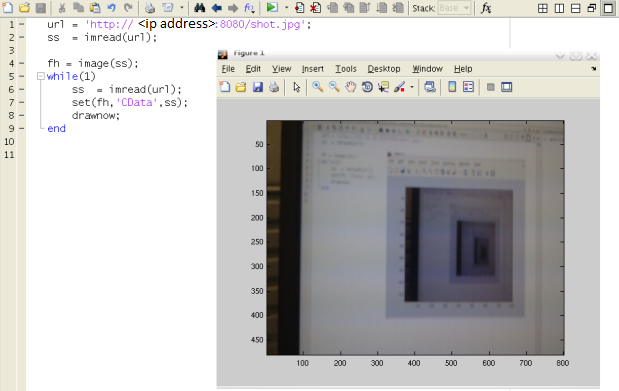 Open MATLAB and use this code snippet to obtain a live preview window. Note that this uses JPG files for discrete frames, which is probably not the fastest way. The app can stream the video and/or audio in multiple ways. Nice recursive ML screen. +1 for that! Is there a similar app for iOS? http://itunes.apple.com/us/app/ip-cam/id333208495?mt=8 appears close enough. Care to try and post another answer? after the original image() call. I'm using a GoPro HD camera which has a URL via an Ambarella video player as http://10.5.5.9:8080/live/amba.m3u8. This is the network address to play in a VLC player. I want to use Matlab for further processing options. Error using imread (line 331) Can't read URL "http://10.5.5.9:8080/live/amba.m3u8.jpg". >> Ipcamtest Error using imread (line 330) Cannot read URL "http://<htp://10.170.26.12>/shot.jpg". Hi, Actually I got this Error.. Can you help me out? Hola a todos. La propuesta de Ashish Uthama me ha resultado muy bien, el unico detalle es que en la IP se debe agregar el puerto que muestra la imagen en la parte inferior en el dispositivo android. Hi Prateek..! Just remove all the connection to your PC except the connection of android and your PC. This error is coming because Your PC is trying to connect to other network and your cam is in other network. how can i save a particular frame as an image from this live feed of video from the phone? You can use DroidCam if you are using an android phone. You'll need to install OS Generic Video Interface driver. is the IP address for the android webcam streaming live video or simply a single image or series of saved images? ipcam() was not introduced until R2015a, a year after amro posted their Answer. Is there any simple solution to this problem in iphone(i.e. without having to install any third party apps) ? I am not sure if this is exactly what you are looking for. However, you can use 'Simulink Support Package for Samsung GALAXY Android Devices' or 'Simulink Support Package for Apple iOS Devices' to access the appropriate smartphone camera. Both these support packages come with a Camera block that allow you to get the Camera data inside MATLAB. You can subsequently connect the Camera block to a Video Viewer block if you would like to visualize the data in Simulink. buenas, este programa funciona bien pero no he logrado capturar una imagen a partir de este mismo, como puedo obtener una captura de imagen y almacenarla ? Good, this program works fine but I have not managed to capture an image from this same, how can I get an image capture and store it? can anybody tell me that how we can do face detection through Android phone pls help??? i need that code? You would either have to write the code in MATLAB and use MATLAB Coder, or else you would have to create a Simulink model and deploy that to Android. Error using imread (line 350) Can't read URL "http://MY_IP /shot.jpg". I have the same issue. Looking for an answer. How can I read other sensors from IP webcam app in Matlab? works only on secured network for me. If I am on a public network, then it gives error. How can I extend this to Simulink model? any suggestions? 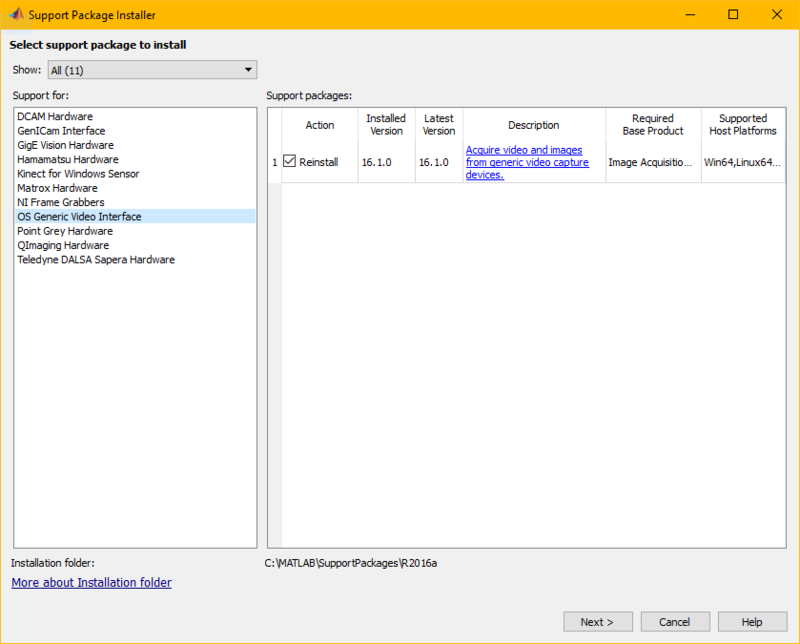 "On Windows platforms, this parameter supports URLs that point to MMS (Microsoft Media Server) streams." how do we interface mobile camera for deep learning? P.S we don't have web cam. pls help us.